Kent Deng and Patrick O’Brien have done us all a service by taking a step back from the conclusions drawn by different participants in the so-called “great divergence debate” to focus on the types and quality of our data, and on some conceptual problems with the application of modern measurements such as GDP to economies that were radically different from ours – in part because they were incompletely monetized. I find myself agreeing with most of their criticisms of both GDP and real wage comparisons, and have some of my own to add. Not surprisingly, then, I share their preference for research on comparative consumption – which was a big part of my approach in The Great Divergence – and agree that this is where we have the best prospects for making further progress on these issues. But I am not as ready as they seem to be to completely discard approaches based on GDP or real wage estimates; and perhaps more importantly, I would significantly modify their assessment of where our discussion of consumption and popular living standards currently stands. We are, quite simply, unlikely to find any data that is good enough to lay these disputes to rest. I agree that the chances of finding significantly better consumption data are higher than are our chances of finding everything we would need to construct truly persuasive GDP estimates, and that the problems with treating wages as representative of living standards in a society like 18th century China are quite severe, even if we could resolve the more narrowly empirical problems with the wage data themselves (e.g. unstated but significant in-kind components, differences in the currencies in which Chinese wages and prices are often quoted, uncertainty about the length of the “day” in day wages, and so on). But at the moment, the consumption data also have significant problems; so while this may well be where we want to concentrate future research efforts, that does not mean that this is the only metric we should be tracking as we make our best guesses about the current state of this controversy. (We could, of course, theoretically all agree not to comment on this controversy until we know more, but that seems unrealistic, given how many other issues it touches upon.) So I would be inclined to keep the wage data, and even the GDP estimates, in play in this discussion, even though I share Deng and O’Brien’s sense that the consumption data are stronger (and even though those data are more favorable to the position I took in my 2000 book). Let me briefly review each of these areas. I would not disagree with Deng and O’Brien’s critique of the GDP approach, or of Maddison’s figures in particular: the latter were based on far too narrow an evidentiary base for much of the world and much of history. I think, however, it is worth noting that there have been some more recent attempts to estimate GDPs, which have the advantage both of somewhat better data and of attempting to construct GDP figures for the Yangzi Delta, rather than for China. Given the points that some of us have made repeatedly about the vastly different scales of China and any single European nation, and about the advantages of comparing the most developed region of a continent-sized China with the richest regions of Europe rather than insisting on national units, these numbers seem to be worth at least some attention. For instance, a recent paper by Stephen Broadberry, Hanhui Guan and David Daokui Li suggests that Britain must have overtaken the Yangzi Delta in per capita GDP by the first quarter of the 18th century. This is, of course, materially different from my claim in The Great Divergence that the Yangzi Delta had not fallen significantly behind until well into the second half of the 18th century, and maybe not until 1800 (though my conclusions were based on estimates of consumption, longevity, and basic human well-being, rather than GDP). Nor has this paper found a way around all the problems with historical GDP and comparisons between very different societies to which Deng and O’Brien have pointed. (These include the radically different market baskets of these two societies, which had relatively little trade between them, the very different degree to which the government tracked various kinds of production, and others; to which I would add, large differences in the degree to which various goods and services passed through the market.) Still, I would not want to simply discard such work, given the difficulties that dog other approaches. Moreover, I think it is noteworthy that a debate between an early and a late 18th century divergence represents a considerably different intellectual landscape than the one we would have if we relied on Maddison’s GDP numbers, or on the non-quantitative work of David Landes, Deepak Lal, and various others – or for that matter, on an earlier attempt by Guan and Li to estimate comparative GDPs, which had previously claimed that a huge gap already existed in the 15th century. An earlier paper by Debin Ma suggested that the per capita GDP of the Lower Yangzi — which he defines slightly more broadly than I do, so that it includes some poorer areas – probably exceeded that of China in general by about 50% in 1750: such an adjustment, patched onto Maddison’s data, would leave the Delta behind Britain, but by considerably less (in percentage terms) than, say, Germany lags Norway today, or the U.S. lags Luxembourg (when nobody argues that this makes either Germany or the U.S. a “backward” economy fundamentally different from the “advanced” ones, as we used to think China was relative to early modern Europe.). Similarly, a study by Li and Van Zanden, based on data for the 1820s, finds Holland well ahead of two counties in the Delta for which there are particularly good data in those years; but as they note, the 1820s were a period of both agricultural crisis due to natural disasters and depression in the cloth trade, the second biggest sector of that region. They suggest that if we had data for 1800, it would show a smaller gap, but still a significant one, with Holland perhaps 50 or even 70% higher in per capita GDP. Admittedly, that is far from the rough parity I had originally suggested at 1800, and would now be inclined to put at somewhere around 1750 instead; there are some plausible adjustments that I think would narrow the gap further, but that is not really the point for now. Instead I would emphasize that despite continuing disagreements and continuing data problems – the latter of which will probably never be fully solved – we have made some progress in narrowing the range of plausible answers about when and how much divergence occurred in these terms. Even if GDP is a seriously flawed measure for purposes of this debate, I am not sure we want to throw it out entirely. The wage data is similarly vexed, and Deng and O’Brien have, I think, explained very convincingly some reasons for skepticism. But let me add two more, extend the discussion of another, and suggest a possible implication of how we might read this imperfect data in conjunction with the even more imperfect GDP data. The first additional cause for skepticism in Robert Allen’s own reconstruction of real wages based on prices and wages recorded by the supercargo of an East India Company ship docked in Guangzhou during the trading season of 1704. Using the same basic approach as he and his co-authors use on the larger data set they compiled a bit later, Allen arrives at the conclusion that the real wages here were roughly equal to those in London at the same time – and Guangzhou, it is generally agreed, was not quite as wealthy as the Yangzi Delta. 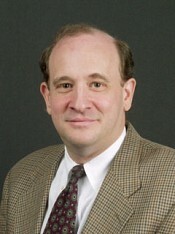 (Allen 2004). Let me make clear that I am not saying that these data give the correct picture, and the other data a false one: there are certainly reasons why the Guangzhou data could be unrepresentative. But these are at least prices and wages that we know were actually paid by individuals in private markets, and that should be relatively free of unreported in-kind benefits. (Chinese workers would certainly not have lived on a British ship, and are unlikely to have eaten British food.) By contrast, the Chinese data in the later and better-known 5 author paper on early modern wages around the world are from administrative reports of prevailing wages, with no evidence that the reporters actually made any sort of survey, and no data at all on in-kind compensation. I would thus not be quick to throw out the Guangzhou material just because it is a smaller database – and that it gives a figure which is so much higher than those derived from the other data seems lke a good reason to doubt the data overall. There is also something highly suspicious about the lack of difference between the wage rates for different parts of China in the administrative data, when every qualitative source we know of agrees that there were very large regional differences in material living standards. Again, this is not sufficient reason to discard these data when we have so few; on the contrary, they represent the best large-scale data set that we have, and the authors have used them to make interesting claims. But I think we need to be very careful about how we use them for this particular debate. But even if these wages do not tell us much about comparative living standards, they might nonetheless tell us something about trends in comparative labor productivity. Significantly, estimates of rural incomes and rural labor productivity suggest that the Yangzi Delta was still on a par with England and Holland on these measures even as late as the 1820s. This would place it far above the rest of Europe – including, of course, a number of countries that began mechanized industrialization and sustained per capita growth well before China did. Delta agriculture was also still well ahead in total factor productivity in agriculture as late as 1820. When taken together with the evidence already discussed which suggests a relatively late divergence, and therefore a fairly sudden widening of the gap once it manifested itself – since nobody doubts that it was quite large by the mid-19th century – this would at least suggest that we should not probably be looking at agriculture to explain the divergence. It also suggests, as Robert Allen has argued in his discussion of British industrialization, that it was higher wages in the growing urban sector that pulled up rural wages, necessitating labor-saving innovations in agriculture, rather than agriculture creating an enlarged urban work force by shedding workers on its own. It does not appear that urban demand exerted a comparably strong effect on rural Chinese wages, even though the barriers to rural-urban migration – whether in the form of exclusionary institutions or urban dis-amenities – were comparatively weak in Qing times; instead, the most likely reason not to leave was that, as noted above, most rural people earned far more than unskilled wage laborers in either city or countryside, and nothing was pushing up urban wages fast enough to overcome this disincentive. A significant gap in urban real wages – if confirmed by further studies that can more fully overcome the problems described by Deng and O’Brien – might then be significant not as a sign of a difference in living standards that already existed, but as a sign of urban changes in Europe that were beginning to create such differences. Broadberry, Guan and Li 2014..
 Maddison 2001: 42, suggesting that Western Europe overtook China ca. 1300. Guan and Li had previously argued (2010) that China was far behind by the 15th century, if not earlier, and had fallen even further behind over the succeeding centuries. See also Landes 1998, Lal 1998. Ma 2004. Compare Maddison 2003: 262.for an interpellated UK figure. It is true, for instance, that not every Chinese worker in Guangzhou was able to offer his services to the foreigners who docked there, perhaps reducing competition and driving up wages. Bt quite a few could – numerous memoirs from foreigners who visited Guangzhou in this period speak about foreigners being besieged by crowds of potential porters and other service providers. Nor is it clear why any restrictions would have driven up the price of labor more than it did that of the many kinds of provisions for which Lockyer records prices paid, and which Allen uses to create the denominator of his real wage. I review some of this data in Pomeranz 2006, and Pomeranz 2011. On the strength of tenant rights, which helped make this income differential durable, see for instance Rawski 1972 Li Wenzhi and Jiang Taixin 2005;Yang Guozhen 1988; Zhang Peiguo 2002. On the distribution of towns across space see Xue Yong 206: 319, and 302-346, 432-475 for a discussion of various estimates of urbanization in the Yangzi Delta more generally. Allen 2009b; Li and Van Zanden 2012. For intra-European comparisons, see Allen 2000..
 Li and Van Zanden 2012:975; Allen 2009b. On Chinese guilds in this period, see Moll-Murata 2009, Pomeranz 2013. Though our data is thus far inconclusive, China does not appear to have had a pronounced “urban graveyard effect” – that is clear evidence of worse health and higher mortality in cities, providing a disincentive to migration that had to be overcome by significant wage differentials, as was the case in early modern and industrializing Europe. This entry was posted in China, Europe, Guest contribution and tagged China, Data, Facts, Great divergence, Western Europe on 2017-06-06 by Manuel A. Bautista-González. What’s Manhattan Worth? A Land Values Index from 1950 to 2013.
by Jason Barr, Rutgers University (jmbarr@rutgers.edu), Fred Smith, Davidson College (frsmith@davidson.edu), and Sayali Kulkarni, Rutgers University (sayali283@gmail.com). Abstract: Using vacant land sales, we construct a land value index for Manhattan from 1950 to 2013. We find three major cycles (1950 to 1977, 1977 to 1993, and 1993 to 2007), with land values reaching their nadir in 1977, two years after the city’s fiscal crises. Overall, we find the average annual real growth rate to be 5.1%. Since 1993, landprices have risen quite dramatically, and much faster than population or employment growth, at an average annual rate of 15.8%, suggesting that barriers to entry in real estate development are causing prices to rise faster than other measures of local well-being. Further, we estimate the entire amount of developable land onManhattan to be worth approximately $825 billion. This would suggest an average annual return of 6.3% since the island was first inhabited by Dutch settlers in 1626. Debates over the high market value of real estate and the unaffordable price of housing occupy a constant place in the public spheres of the major cities of the world, especially in those where land is already a very scarce factor and vertical, intensive urban development takes place in the form of tall buildings, towers and skyscrapers. However, historical perspectives on the real estate and housing markets are for the most part lacking in these discussions. In their paper, Jason Barr, Fred Smith and Sayali Kulkarni attempt to fill the gap for New York City, a capital of capital like no other, to borrow from the title of the book by financial historian Youssef Cassis (Cassis 2007). In their work, published in NEP-HIS 2015-04-11, the authors develop a land value index between 1950 and 2013 in Manhattan, the island that defines the Big Apple like no other borough does. According to the deflated value of their index, the real value of real estate in Manhattan since 1950 has increased at an (otherwise impressive) average annual growth rate of 5.1%. The authors identify three long cycles: the first one, 1950-1977, roughly coincided with the golden era of Western capitalism, a skyscrapers boom and the demise of urban industries; the second one, 1977-1993, began with the consequences of white flight to the suburbs and fiscal crises in the city and lasted until the financial Big Bang of the late 1980s and early 1990s; and the third one, 1993-2007, manifested the impact of financialization of the U. S. economy, the rise of Manhattan as a services powerhouse, and the emergence of New York as a truly global city, in the sense proposed by the sociologist Saskia Sassen (Sassen 2001). 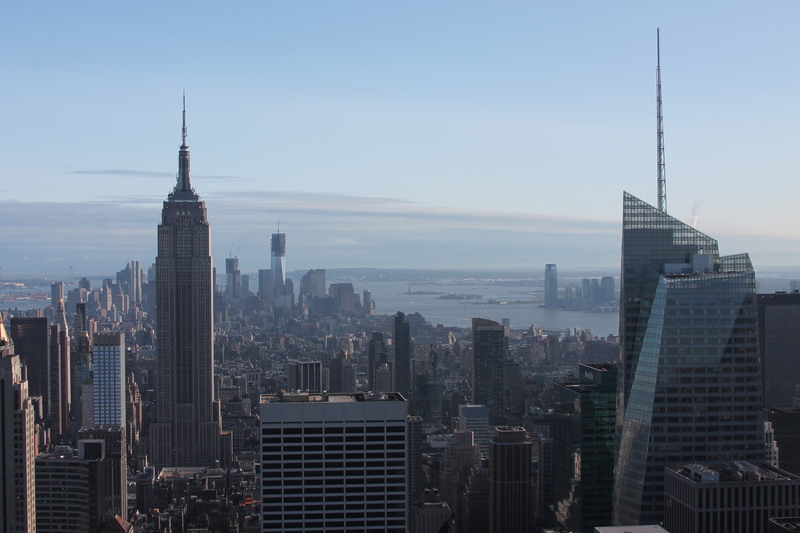 View of Manhattan from Top of the Rock Observation Deck, Sunday, May 20, 2012, 5:13 PM EST. 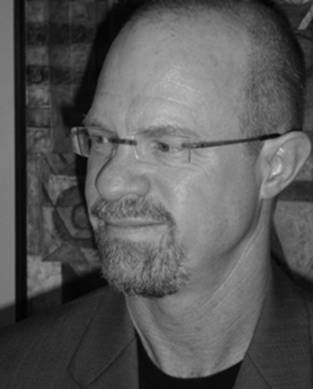 A gift from the author to the loyal audience of the NEP-HIS blog. The authors go through the methodological problems of developing a land value index. The first problem has to do with whether one assesses the value of undeveloped land or whether one incorporates the constructions on it. The second problem is that of using either market prices or assessment of values for taxation purposes, for example. A third problem derives from the divergence of market prices and assessed values, a divergence which is considerable in the case of New York City during this period. This entry was posted in United States and tagged 20th century, land, land values, New York, property, real estate, United States on 2015-06-10 by Manuel A. Bautista-González. 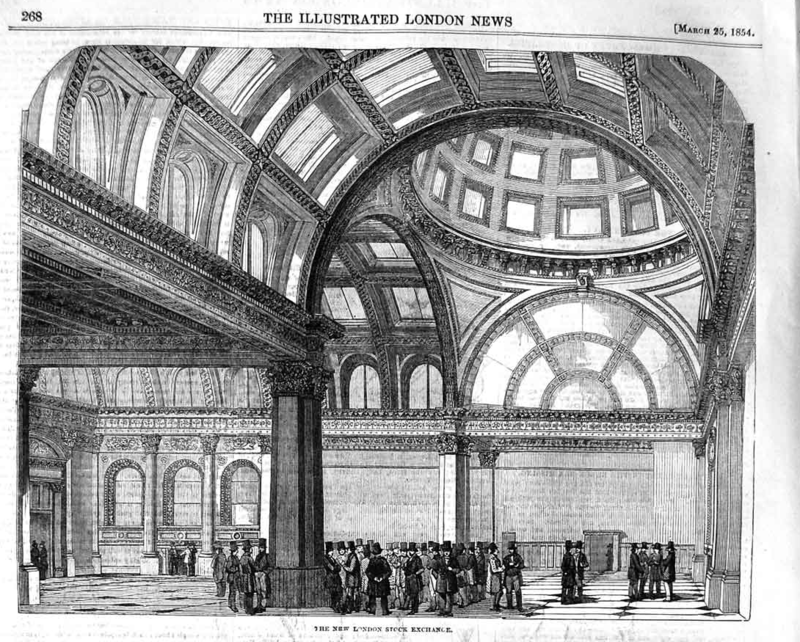 Interior of the London Exchange, The Illustrated London News, March 25, 1854. Bloody Foreigners! Overseas Equity on the London Stock Exchange, 1869-1928. Abstract: This paper presents data on quantity, capital gains, dividend, and total returns for domestic and overseas equities listed on the London Stock Exchange during 1869-1928. Indices are presented for Africa, Asia, Europe, Latin America, North America, Australia/New Zealand and for the finance, transportation, raw materials, and utilities sectors in each region. Returns and volatility were typically highest in emerging regions and the raw materials sector. Dividend yields were similar across regions and differences in total returns were due largely to disparities in capital gains. Returns of firms in more industrial markets were relatively highly correlated with each other and with developing regions with which they had substantial colonial or trade connections. Contingent liability was most extensively employed where leverage was high and the physical assets were either meager or inaccessible to creditors. Since it was established in 1801 and most notably during the period commonly referred as the first globalization, the London exchange was the most important market for securities in the world. In this paper, distributed by NEP-HIS on 2014-01-17, Richard Grossman presents an analysis of newly assembled data on UK and foreign equities listed in the London Stock Exchange between 1869 and 1928. The study of the performance of equities in London by Grossman offers an unparalleled register of the rhythms of the world economy, from the late nineteenth century until the start of the Great Depression. It thus offers an excellent portrait of the role of the London equities market as the chief financial intermediary for capital flows within the British empire and the rest of the world. Data to construct annual equities indicators from 1869 to 1929 was sourced from the Investor’s Monthly Manual, which was digitized by the International Center for Finance (ICF) at the Yale School of Management. Grossman describes with detail the problems of determining the industrial sector of each firm in question, the criteria used by the staff of the Manual and the ICF to ascertain the domestic or foreign nature of the firms therein listed, and accounting issues arising from several other situations, such as a share’s volume of trade and differences between the nominal and market value of shares at different points in time. Grossman uses end-of-January data from 77,248 observations of equity securities, as “equity, a claim on firm profits, may be more likely to reflect expectations about future corporate profits than bonds” (Grossman 2014: 4). 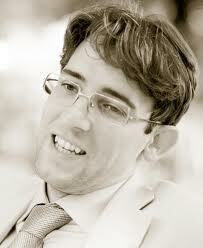 This entry was posted in Britain, Economic History on 2014-02-20 by Manuel A. Bautista-González. Abstract: Is political unity a necessary condition for a successful monetary union? The early United States seems a leading example of this principle. But the view is misleadingly simple. I review the historical record and uncover signs that the United States did not achieve a stable monetary union, at least if measured by a uniform currency and adequate safeguards against systemic risk, until well after the Civil War and probably not until the founding of the Federal Reserve. Political change and shifting policy positions end up as key factors in shaping the monetary union that did ultimately emerge. In this piece published in NEP-HIS 2013-04-13, Peter Rousseau argues for the need to complicate the widely-held, simplistic view that political union is a necessary condition for a successful monetary union. By studying the intersection of politics, money and finance in the United States from the American Revolution to the Great Depression, Rousseau posits that there is no automatic mechanism to ensure the concurrence of political and monetary union. 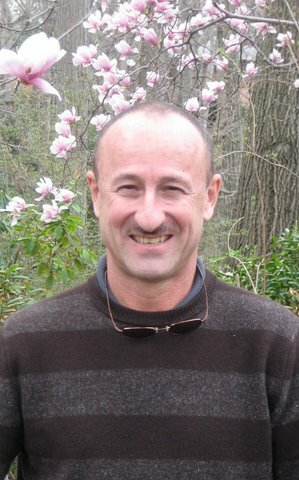 Although Rousseau begins his paper with a rather narrow definition of monetary union as a “system with a uniform currency and adequate safeguards against systemic risk” (Rousseau 2013: 1), he expands it throughout the paper to take into account other characteristics and consequences of processes of monetary unification. The most obvious element of monetary union is the adoption of a single unit of account and uniform currency throughout a territory. To function, monetary union requires credible authorities with effective powers to control the supply of money while properly backing liabilities to minimize uncertainty. To reduce transactions costs, monetary union also demands institutional arrangements between the government and the banking system as a private supplier of means of payment. With monetary union, short-term and long-term capital markets become part of a payments system, whereby due to network effects, the reduction of borrowing costs in regular conditions can meet rapidly-spreading liquidity squeezes in times of financial distress. To recapitulate, monetary union has a dual, difficult nature, for it requires the virtuous alignment of public and private interests; henceforth, politics will mold for better or for worse the actual operation of any monetary union. This entry was posted in Economic History, Money & Banking, USA on 2013-08-07 by Manuel A. Bautista-González.